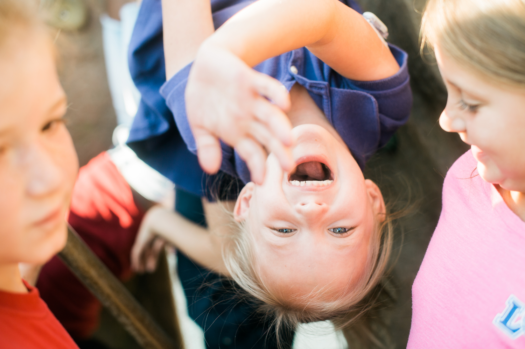 Have you ever wondered what it’s like in the K4/K5 world at LCS? If so, consider this your invitation to learn about this very special place. Of course, you are always welcome to observe our program in action! When your K4/K5 child joins the LCS family, he or she will live, laugh, love and learn. Lakeland Christian’s Early Childhood program is developmentally appropriate, which encourages children to grow and mature naturally in every area of life. By the end of the K4 year, the goal is for each child to be prepared socially, emotionally and academically for K5. Each child is considered as an individual, and the faculty meets each where he or she is. LCS Early Childhood faculty members are passionate about their work with the youngest children on campus. These teachers live for the Lord and serve at LCS because they really want to be here! Their love for the Lord overflows as they intentionally model that attribute for the students. Even at this youngest level, the faculty teaches each subject and activity in the light of God’s Word. The teachers do an amazing job of applying the Scriptures to the young lives in their care. If you have any questions about our Early Childhood program, feel free to contact Mrs. Luci O’Byrne, Elementary Principal, at lobyrne@lcsonline.org or by calling (863) 688-2771. We use the Association of Christian Schools International (ACSI) and ABEKA Bible curriculum. We teach Bible stories featuring both Old and New Testament characters that reinforce character and Christian living. Teacher-created units help to build number sense. Students learn by playing with numbers in various centers. The Zaner Bloser curriculum introduces and reinforces correct letter and number formation. K4 teachers use DIG (Discover, Inspire, Grow) and Letter People curriculum. Lessons in science and social studies are incorporated through the letter of the week and holiday activities. *Students may be dropped off anytime between 7:20 a.m. and 8:00 a.m.
**The school year begins in August and runs concurrently with a standard school year. Payment options include a 12-month payment plan, although the K4 program is not in session during the summer months. Full tuition is charged for the oldest child. The second child receives at 10 percent discount, and the third child receives a 20 percent discount. Beyond three, each additional child receives a 50 percent discount. NOTE: The multi-child discount does not apply to Discovery Program tuition or for part-time students. Students may be dropped off any time between 7:20 a.m. and 8:00 a.m.
At the beginning of the school year, parents are invited to visit the K4 classrooms for breakfast and the opportunity to get to know other families. The entire LCS school family comes together to celebrate the birth of our Lord and Savior Jesus Christ through this event. Students in grades 3-12 participate, but students in grades K4-2 are encouraged to attend. To celebrate the letter “D,” dads are invited to their child’s classroom for a delicious dessert and fun time with the K4 students. This is a K4 through fifth-grade event. All grandparents and grand-friends are invited to come for a light breakfast and special program. After the program, they are able to visit the classroom(s) of their grandchildren. Students in the K4 program put on a special program to celebrate the birth of Jesus. Special events are held throughout the week to celebrate God’s creation. K4 students pay special attention to the water cycle, and we end our unit with centers. Parents are welcome to attend. K4 students enjoy a yummy Thanksgiving dinner with turkey, ham and all of the trimmings! Each child in grades K4-5 participates in field events, fun relays and an obstacle course. Parents are invited to join the fun as well. K4 students demonstrate all that they learned throughout the school year at this special year-end program. These small group activities have two goals: the first is to have hands-on activities that celebrate the seasons and holidays. The second purpose is to give our parents the opportunity to be involved with their child’s school experience. It is a wonderful time of discovery for the students. Students in the K4 program go on two field trips during the school year. Typical trips include visits to the zoo, concerts and local parks. For safety reasons, we request that a parent or other adult chaperone accompany each student. The Center for Early Childhood Education was constructed in 2008. The classrooms are uniquely designed and connected to facilitate the complete education delivered within the program. The Ladd Educational Suite houses two of the three K4 classes. Both classrooms are large, have bathrooms and storage and are equipped with SMARTBoards. The K5 suite is made up of four large classrooms, each with its own bathroom, storage and SMARTBoard. A large commons area allows all of the classes to come together and includes cubbies, a platform stage and a large, wall-mounted flat panel TV. The suite also houses an additional K4 classroom, a conference room and a teacher workroom. The shaded K4/K5 playground features equipment for the youngest students on campus, including a fall-safe surface and a shark tooth pit.